Hello and welcome back. It's Celeste here with you for another Cheery Lynn project! Today I have a surprise for you. 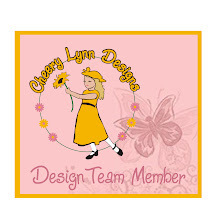 My daughter Amberly created a card with my Cheery Lynn Design dies, and this is her creation! She found the silhouette of one of my dies, the Fanciful Flourish. She asked if she could use it and together we cropped and put it on white card stock. I asked what she would like to do next, and she chose to use the Darling Daisies. She even new what to do with them! Amberly then decided that she was going to put the rub-ons in the corner, and that it was good the way it was. Don't you love the simplicity of children? She is going to give it to her Nanna, who is in a nursing home. To keep it in theme with Amberly's project, I decided to make a card too! I saw this image on a free vintage stamp site and knew I wanted to use it. It is not a traditional scene to use on a card, but I loved the colours and the style. Using the new Swedish Spring Oval Frame, I cut it in half and put half on the front, and the other half on the bottom of the easel card. Doing this also helps the card stay upright (or open). The using the Cuties 2 and the Miniature Rose dies I cut the flowers and popped them on with the Olive Branches tucked just underneath. I added the pin, using the same colour theme. 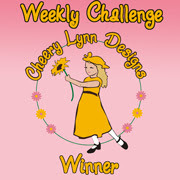 If you would like a challenge, Cheery Lynn Designs has their latest on now and you can find all the details 'HERE'.